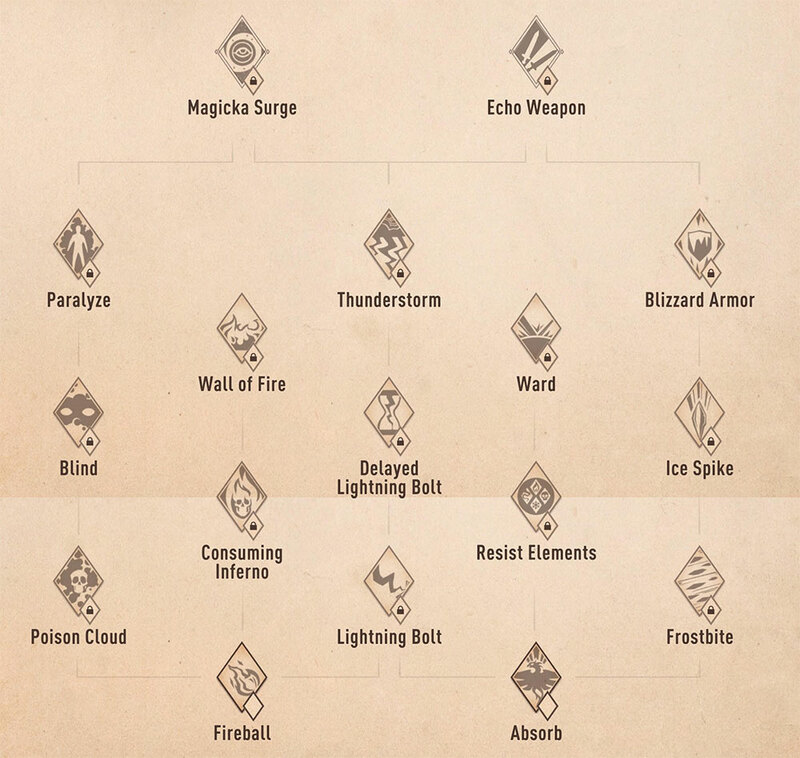 Our Elder Scrolls: Blades Spells List feature all of the spells you can unlock in the game. If you are an aspiring mage, then you are going to want to know what you will be able to wield as you level up your character. Spells are unlocked by increases your character's level and gaining skill points. Each spell requires you to be a certain level, and costs a specific amount of points to unlock. Damage listings are based off the first level of the spell and it will increase as it is leveled up. A fiery projectile deals 114 fire damage on impact. If casting is interrupted, the fireball explodes on the caster, dealing 29 fire damage. A magical sigil appears instantly. It negates up to 31 damage directed at the caster and converts 100% of it into healing. A cloud of poison gas grows to engulf enemies, dealing 26 poison damage per second. Can be interrupted while casting. A surge of electrical energy grows in front of the caster, then shoots forward to deal 47 shock damage to Health and Magicka. Can be interrupted while casting. A stream of frigid air deals 31 frost damage per second to Health and Stamina while Slowing enemies and increasing resistances to physical damage by 14. Can be interrupted while casting. A continuous stream of flames deals 60 fire damage per second while draining the caster's Stamina (Health if out of Stamina). Can be interrupted while casting. Protective energies cure the caster of elemental conditions and increase resistances to elemental damage by 39. Can be interrupted while casting. A ball of venom deals 138 poison damage on impact. Enemies that suffer more than 123 damage are temporarily Blinded. Can be interrupted while casting. A ball of electricity shoots up, then strikes as lightning 5 seconds later, dealing 67 shock damage to Health and Magicka. Can be interrupted while casting. A razor-sharp ice spike deals 145 frost damage to Health and Stamina on impact. Enemies that suffer more than 131 damage are stunned. Can be interrupted while casting. A wall of fire appears instantly. It deals 70 ffire damage to anyone attacking through it, including the caster. A magical barrier increases Armor Rating by 68 and negates up to 203 elemental damage. Can be interrupted while casting. A ball of venom deals 202 poison damage on impact. Enemies that suffer more than 182 damage are temporarily Paralyzed. Can be interrupted while casting. A storm cloud appears instantly above the target. Every 3 seconds, it emits a lightning bolt that deals 72 shock damage to Health and Magicka. A layer of ice with 97 Health instantly covers the caster. It takes half of all damage directed at the caster, and deals 4 frost damage per second to Health and Stamina. Instantly increases Magicka regeneration by 82 per second, speeds up spell cooldowns, and prevents spell interruptions. After the surge, Magicka falls to 0 and Magicka regeneration stops for 10 seconds. A magical echo of the caster's weapon appears instantly, duplicating all of its attacks with a 0.5 second delay. Light, versatile and heavy echoes deal 96, 109, and 123 damage, respectively.